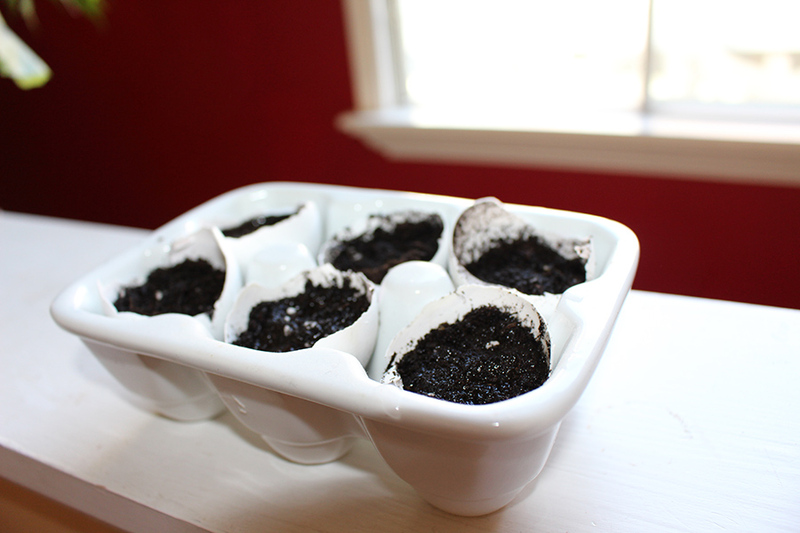 If you started seeds a couple of weeks ago, they should be peeking up through the soil by now. 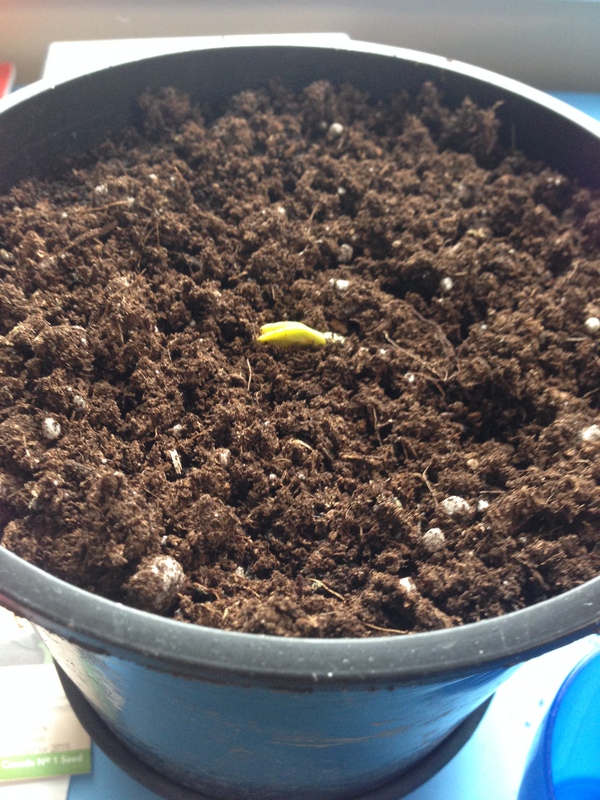 Some of the slower-to-germinate seeds, like peppers, will likely need another week. A new-to-Parkallen gardener has asked me when the date to plant seedlings and sow seeds directly in the garden is in Edmonton? Seed packets are always telling us to sow “after all danger of frost is past.” When is that? I consider the May 24 long weekend the date to plant in Parkallen. Of course, this can vary from season to season so keeping an eye on the Spring temperatures is the thing to do if you’re keen to get a longer growing season in. The Farmer’s Almanac says we’re good to go on May 7th in Edmonton, and Vesey’s Seeds‘ frost chart says the same. But Alberta’s Department of Agriculture has different first / last frost dates for different parts of Edmonton. Alberta Ag predicts the growing season as May 12th (Last Frost) to Sept 10th (First Frost) in Edmonton/Namao Airport. But for Edmonton/International Airport the season is shorter: May 24-Sept 10th. I’ve noticed that Parkallen has it’s own micro-climate and it’s colder here than in most of Edmonton. The snow is long gone and tulips are blooming downtown and in the University area when the tulips are just beginning to peek up through the soil in Parkallen. Did you know that Parkallen used to be a lake? What do you think? Do you agree with me that May 24 marks the beginning of Parkallen’s growing season? 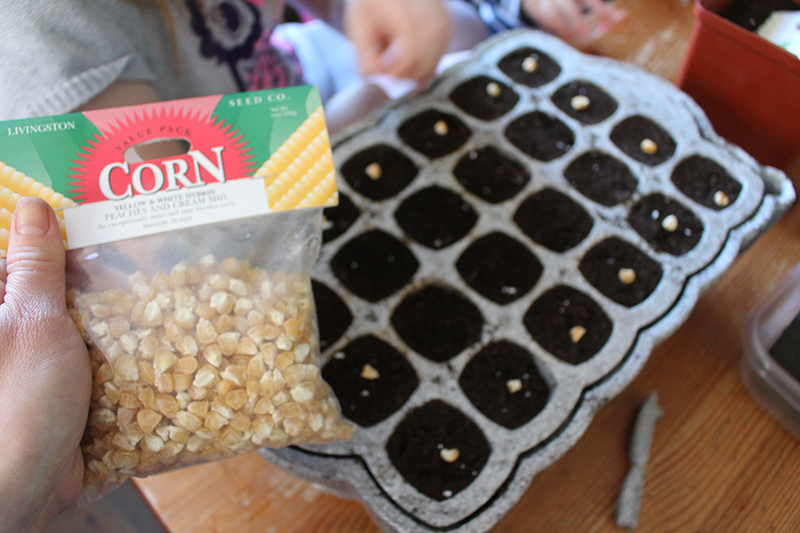 It’s that time of year: Parkallen Gardeners: Start your seeds! 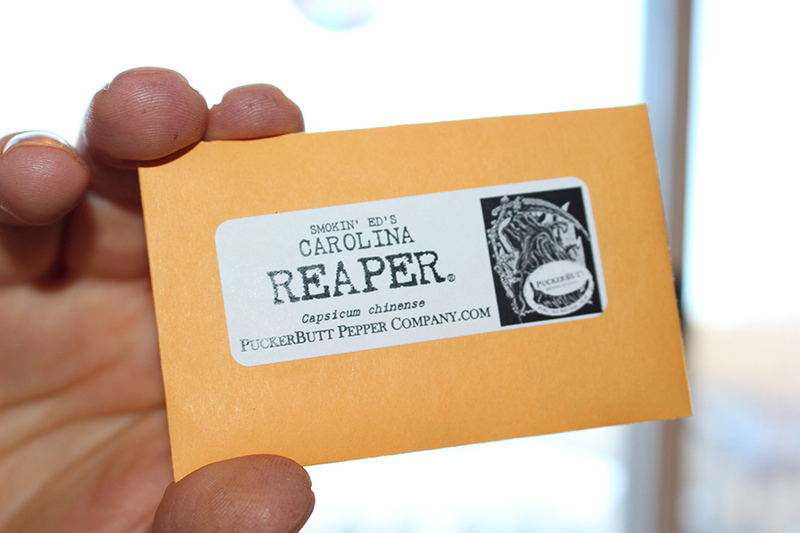 Brent has special-ordered seeds from North Carolina where the PuckerButt Pepper Company claims to have cultivated the hottest pepper ever grown in the history of the world. Of course we’re willing to swap seedlings this Spring. What are you growing? Carolina Reapers started in eggshells. Grow little peppers! Grow! 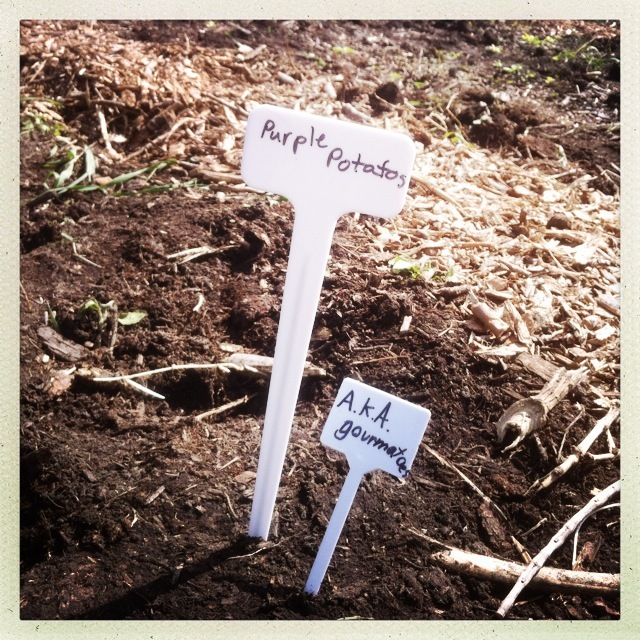 We’re on eggshells over here waiting for them to germinate… Hope it’s not too corny of me to ask… but will you grow some extra of whatever you’re starting this year for the Parkallen Community Garden? If everyone grows a tomato plant or two, we won’t have to buy any. And, if you’d like to try something exotic like eggplant or … canteloupe … the PCG has sunshine to spare. 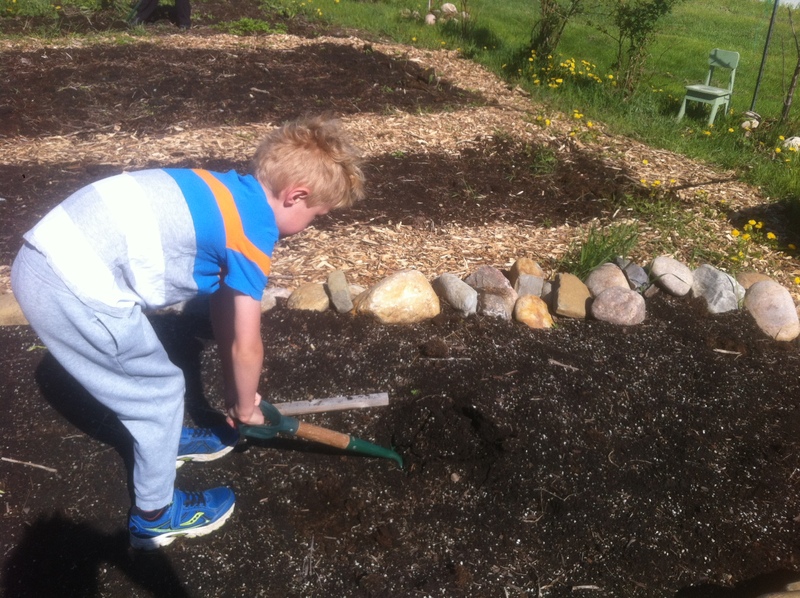 The Parkallen Community Garden was planted over four sessions in late May and early July this season. 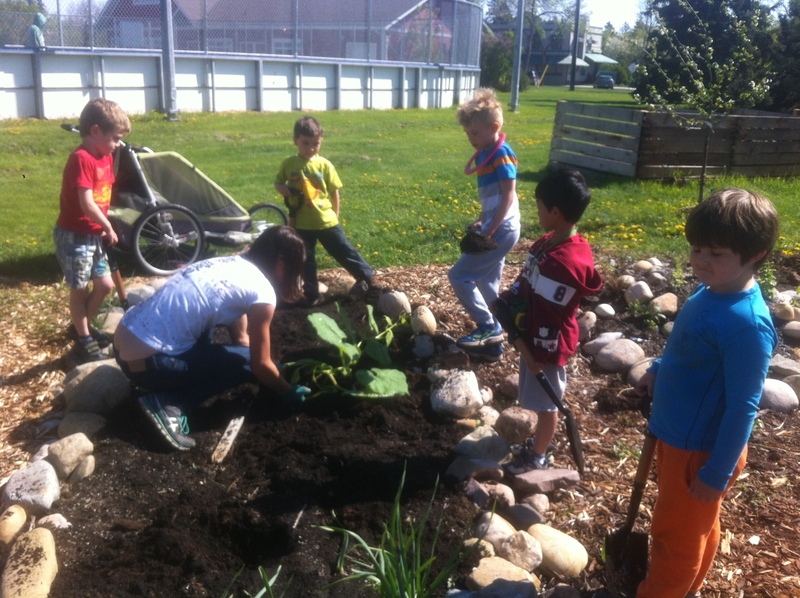 The Grade Threes at Parkallen School finished the spring planted with a big bed of pumpkins and some purple potatoes, subtitled above “gourmatoes.” They’ll be ready to harvest when the class is starting grade four. 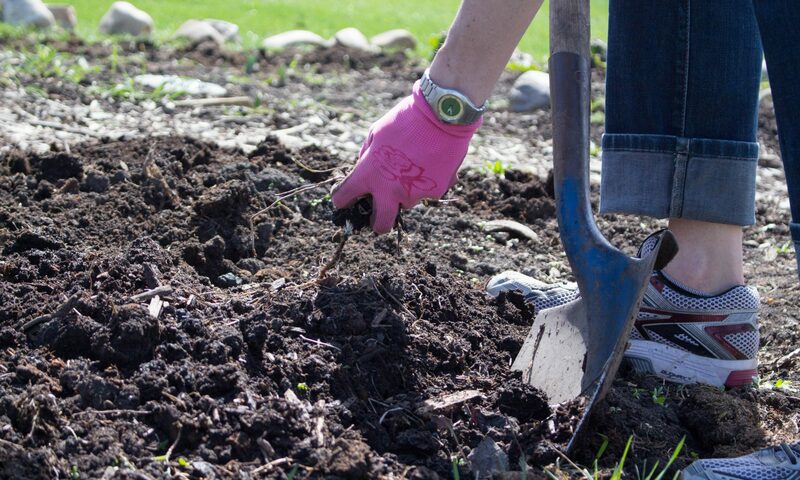 All gardeners are welcome to dig a hill or two of potatoes at harvest time, regardless as to whether you were able to make any of the plantings or not. We also have a thriving bed of Yukon Golds. 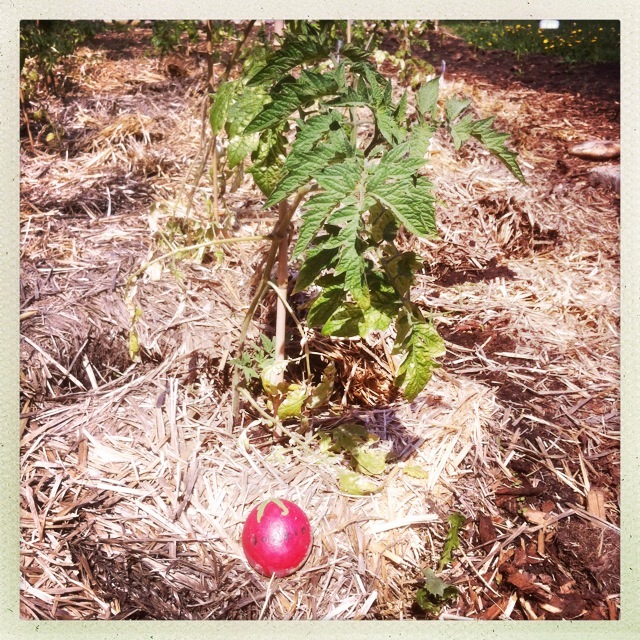 Our tomato patch was populated with plants started at home in the early, early Spring when the ground was still frozen (e.g. November.) 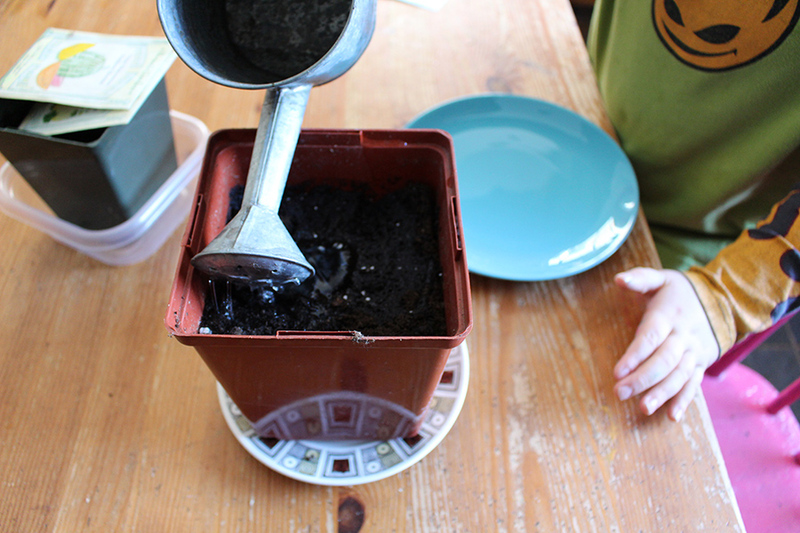 Consider contributing your own home-grown bedding plants next year. 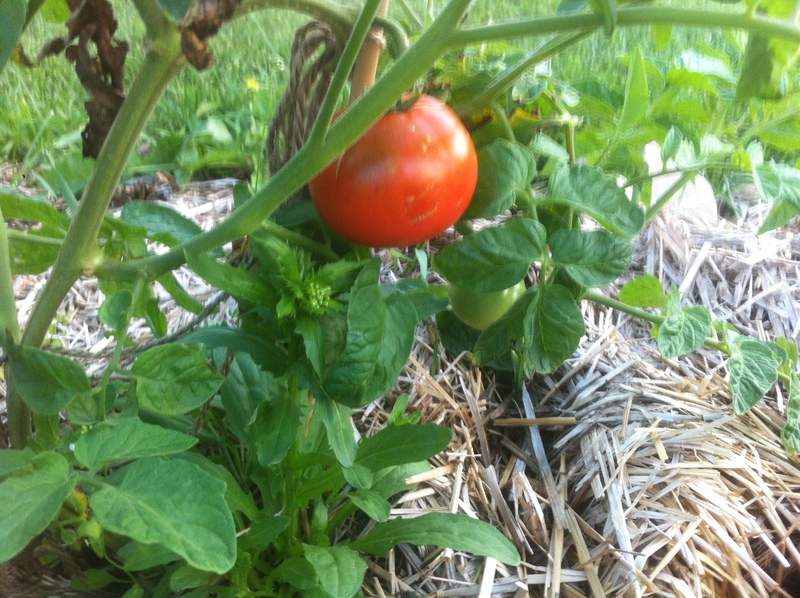 The first ripe tomato was spotted in Mid-July. Remember, if you see a ripe tomato, pick it and eat it while the picking is good. 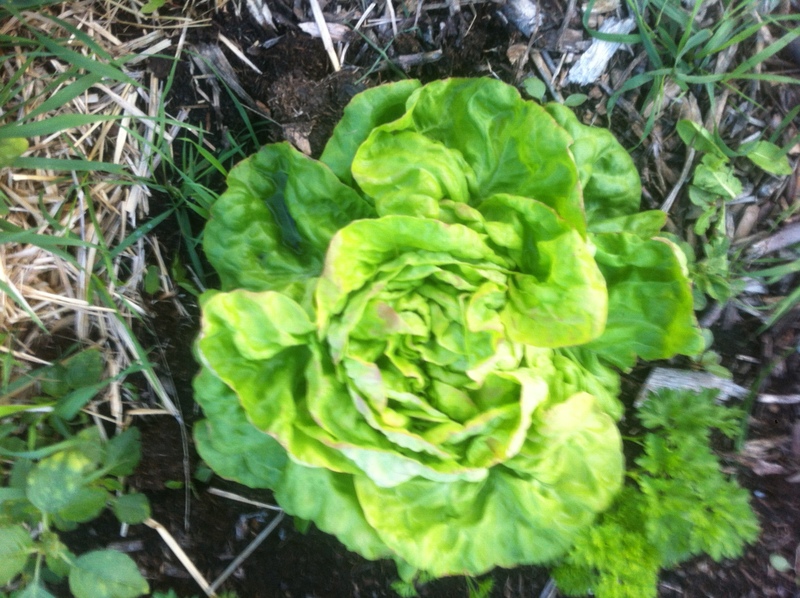 A beautiful head of lettuce would like to be introduced to some lucky gardener’s salad bowl and tongs. There are sprigs of parsley growing conveniently beside it. 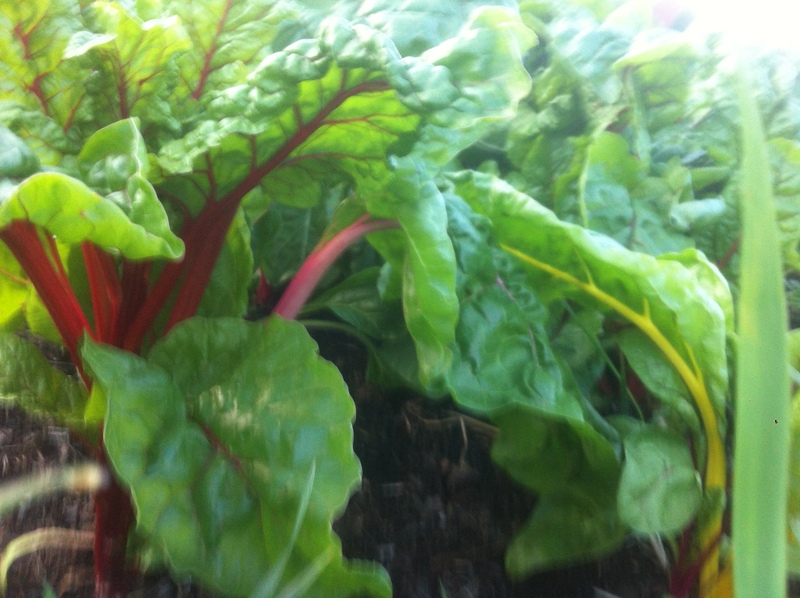 The rainbow chard is perfect for eating right now. I like it wilted with a pat of butter on top. Snap off the medium sized leaves. You need about half a grocery bag full for a small bowl of wilted greens. 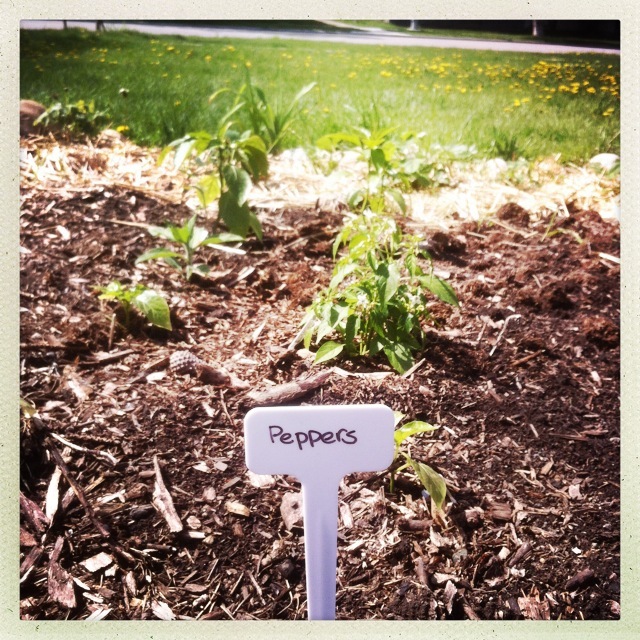 The pepper patch was populated with a combination of greenhouse-bought and home-grown pepper plants. Beware the “Basket of Fire” variety. The Three Sisters (corn, beans, squash) are coming on strong this year. The corn was grown from plugs from the greenhouse, the beans and squash (zuchinni) from seed. 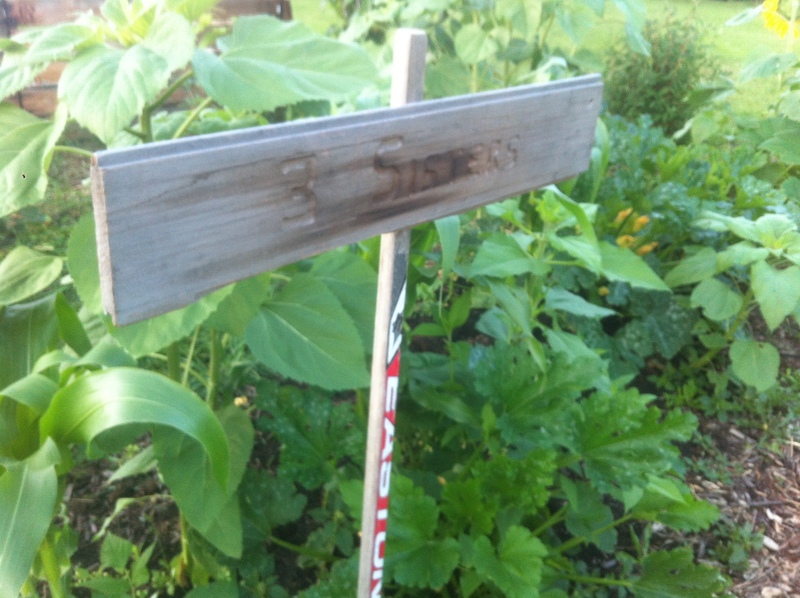 What edibles can you find in the Parkallen Community Garden? Last year’s giant pumpkin was so beloved that we’ve planted another Big Max variety. 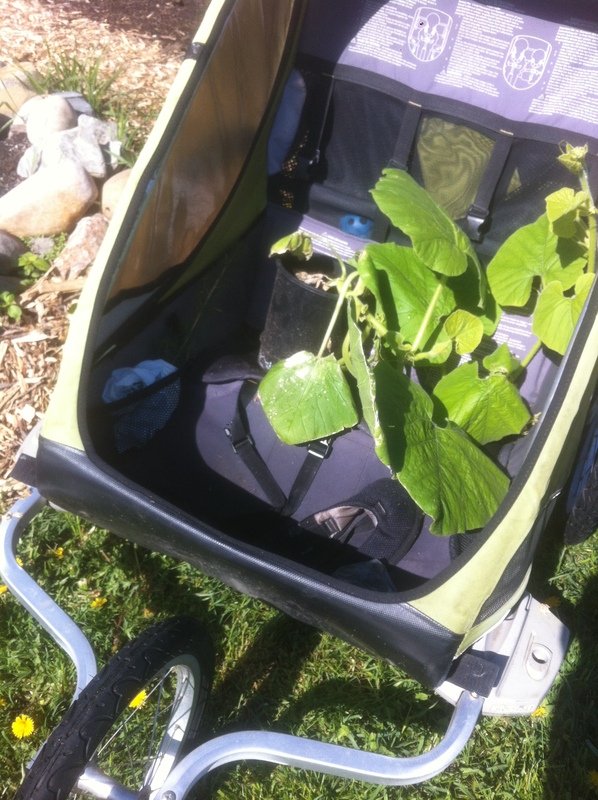 The pumpkin seedling arrived at the PCG this spring in a baby stroller, of course. Double-wide, of course. She has her own bed of organic soil at the PCG. No chemicals are ever used to make Maxine big — just a large growing variety in healthy soil. Will she outweigh the kids and the woman who planted her? Time will tell. Visit Maxine this summer and fall at the Parkallen Community Garden.